This compact little heater kicks out the heat and is ideal for camping, caravanning, motorhomes or just around your home. With instant fan forced heat and variable thermostat control, it’s a versatile piece of equipment. 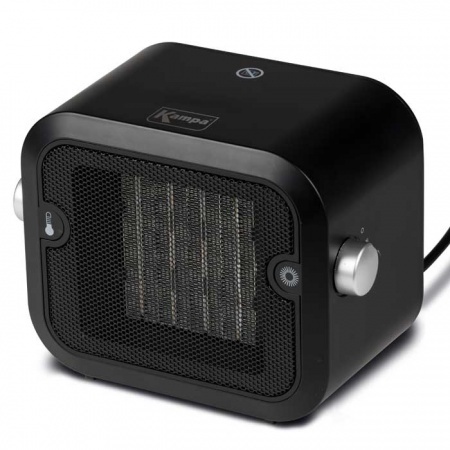 The heater is constructed of black plastic cool touch housing, with a black metal grill across the front. There is a thermostatic control dial on one side and the function setting dial on the other. On the underside is a Tip-over protection switch that instantly cuts out the heater if it is not in contact with the floor. The mains lead is approximately 150cm in length and has a 3 pin plug. The heating element is Positive Temperature Coefficient (PTC) which refers to materials that experience an increase in electrical resistance when their temperature is raised. There are three heat settings: a cooling fan, 750w or 1500w. The Cuboid has an energy efficient heating element and thermal overheat protection device.